Being a student of the Japanese tea ceremony for almost three years now, I have gradually been allowed to make Usucha and performing Sumi-demae for the Ro. This summer season with the start of the Furo, I was able to practice Sumi-demae for the Furo for the first time. Somehow it seems to be easier than the Ro because there is no Hai (ash) added. The Furo portable brazier has a bed of ash which is carefully shaped and should not be messed up by adding more ash. The size of the Sumi is smaller than with the Ro. Also the Haboki (feather) is different, the one used in summer for the Furo is wider on the right side. The difficult part for the furo is not during the sumi-demae. It's the time when you shape the ash before temae. If the ash is packed too tight, the sumi won't burn too well. In fact, they might not burn at all. 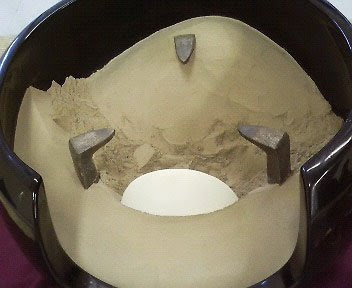 If the ash is too loose, when you place the kama back, the kawara would fall or the shape would ruin.